Mumbai’s street food fusion, now available in L.A.
Frankie rolls are an easy sell to the uninitiated. A popular handheld snack on the streets of Mumbai, they’re essentially Indian burritos: oven-baked flatbread wrapped around stewed proteins for maximum portability. But in L.A. they can be hard to track down. The city’s sole brick-and-mortar frankie specialist? Hidden inside a Chevron station off the 405, where chef Kamaljit Singh fires garlic naan and roti bread to order in a blazing tandoori oven. 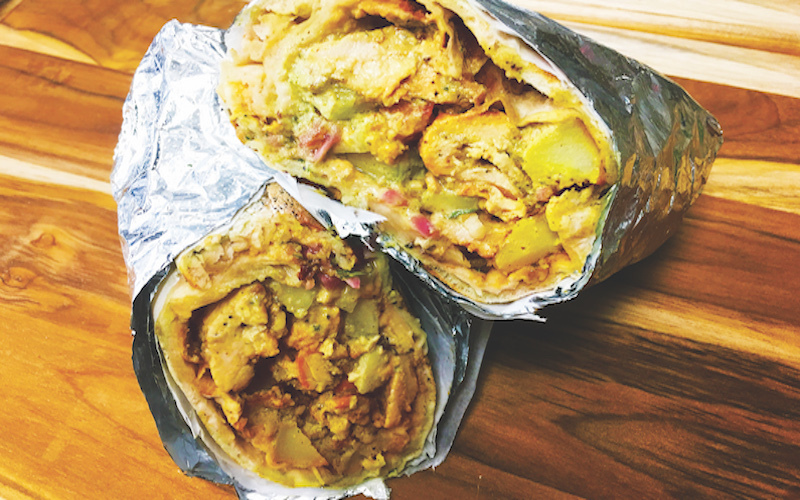 HOT DEAL: Skip the chicken tikka in favor of the Tandoori Paneer Frankie ($9, below). Stuffed with roasted Indian cheese, mashed chickpeas, cumin potatoes, mint chutney, tamarind sauce, and a few slivers of tomato, cucumber, and onion, it’s a real mouthful. TRY THIS: Pair your frankie with a mango lassi ($3) and a crispy potato samosa ($3) for the best Indian combo you’ll ever find in a gas station. The Bombay Frankie Company is located at 11261 Santa Monica Boulevard in West L.A.
RELATED: Chinatown’s Lasa is Redefining Filipino Cuisine in L.A.